Every morning on my way to work I pass a gentleman walking his dog underutilising his dog nose. Actually, I pass him twice; once prior to stopping to get my morning coffee and once again afterwards. I first began noticing this dog about 6 months ago. Why is this cause for concern? Of course I pass many other owners and their dogs, however, this one dog stands out. Why? Because this poor dog would like to be anywhere else but where she is; she is really, really worried! My heart goes out to the dog, who I am referring to as a ‘she’ however I really have no idea. She pulls on lead in all directions, stops and starts, is constantly scanning and turning her head from side to side, trying to turn around and look behind her, flinches when cars go past… overall it is pretty easy to see that she is really, really worried. So what about the owner? What is he doing? He’s walking at a reasonably brisk pace, occasionally he gives the lead a bit of a pull to ‘encourage’ the dog to keep moving when she tries to stop and sniff or veers off the path… seemingly oblivious to his dogs’ signs of stress. Maybe he’s like many other dog owners out there that are just in a habit of taking their dog to the same location or walk the same route? Or perhaps he’s not ever thought of walking a different route that his dog finds less stressful? It could also be that he simply does not recognise the signs that his dog is stressed? Or is it that he thinks that his dog will eventually become familiar or used to the route and be able to relax more…? Or maybe he’s just in a hurry to get to work and needs to tick the box of ‘walked the dog’? The problem is that over the last 6 months, that I watch this dog, she is not getting ‘better’ instead, she is getting worse. Her behaviour is now becoming a habit and reflexive; it is just what she does. So I hang in hope that one day this gentleman will arrive in my consult room so I can help him and his dog understand each other better. So that I can help him understand that his dog is finding this form of exercise STRESSFUL. Exercise should not be stressful, it should be relaxing! So what does this dog need? This dog needs a walk that will decompress and de-stress. What is a decompression and de-stress walk ? This type of walk can be done on usual 1.8-meter lead, long lead, or off lead depending on the location. If on lead a harness should be used to allow freedom of movement. It is a walk that enables the dog (and the dog nose) and owner to completely unwind and relax where the focus is on exploratory behaviours such as sniffing (exercise that dog nose!). Not just sniffing a bit here and a bit there, but being able to follow a complete scent trail from start to finish. A scent trail to a dog is like a book to a human; only being given page 1 to 10 then 23 to 41 then having the book closed is not relaxing … it’s frustrating! It is a walk that is focused on the quality, not the quantity; the content, not the distance. The dog chooses the route (where safe). The dog sets the pace. If the pace is too fast then the dog should be encouraged to slow down and explore. 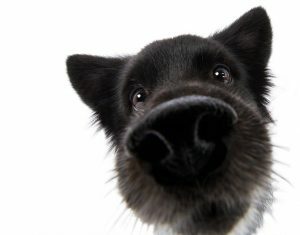 This can be done by taking the dog to a tree or tuft of grass, scratching up some earth, etc….see your dog nose in action. During the walk, no cues or commands should be given unless absolutely necessary. Giving a dog cues or commands means that they are in ‘work’ mode and everyone needs to ‘clock off’ at some stage. Both owner and dog should finish the walk feeling completely relaxed and mentally fulfilled. So take the time, smell the roses and try a decompression walk. Your dog will thank you! If you would like further information or learn how to walk your dog using these methods please contact us.